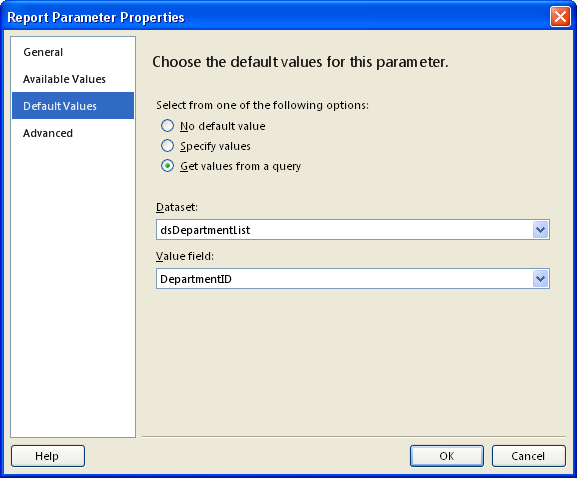 By default, no values are selected. 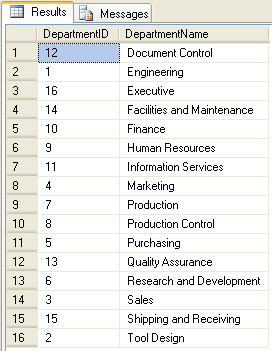 To make it a bit more user-friendly, let's select all departments by default when the report first loads. This is done on the Default Values page. 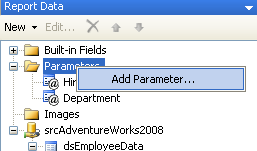 That's it, the multi-value report parameter is created! Of course, at this moment it doesn't have any effect on the report's content yet (switch to Preview if you don't believe me and have a look). We'll get to that next. To be able to handle the values passed into our stored procedure, let's first find out what exactly our report is passing into it. We'll do this by temporarily creating a new stored proc that will just accept the parameter values and return them. 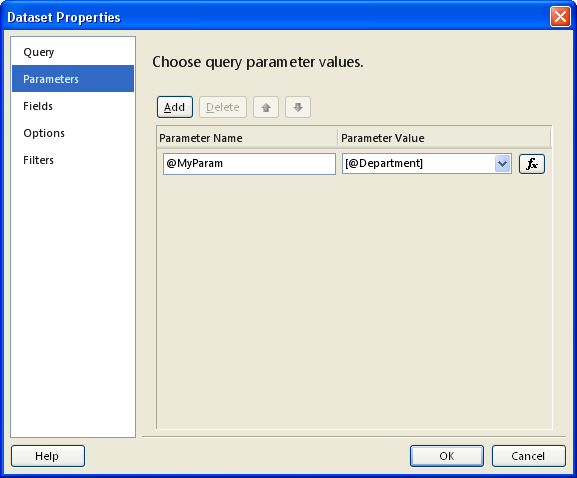 If you compare that list of numbers with the result that our dsDepartmentList query returns, you'll see that these are the values from the DepartmentID field in exactly the same order as in the query's result. And separated by commas. So in other words: it's a comma-separated string of selected values. Now that we know what exactly the multi-value parameter passes to a stored procedure, let's modify our main procedure by adding the extra parameter to it. Since our parameter is a comma-separated list of our values, I've used the IN operator to filter on only the selected values. Conversion failed when converting the varchar value '12,1,16,14,10,9,11,4,7,8,5,13,6,3,15,2' to data type smallint. This error comes from our stored procedure. It complains that it cannot convert the list of values from a string to a smallint. Weird isn't it? Well, maybe not. Let's have a look at what's going on. We've seen that our first implementation of using the IN operator is not a good idea. So we need to find another way to get this stored procedure working. Note: it would actually be possible to use the previous method in combination with dynamic SQL but I'm not going to apply that technique here. In case you are interested in that method, just construct a long string that contains the whole query as it is in the working SELECT statement above. For more info on dynamic SQL I'd like to point you to this excellent article by SQL Server MVP Erland Sommarskog: The Curse and Blessings of Dynamic SQL. The IN operator can take a subquery. So now we need to find a way to "select" the values out of our comma-separated string of values. I am not going to re-invent the wheel and use a function that's mentioned in another great article by Erland Sommarskog. The article is called Arrays and Lists in SQL Server 2005 but is also applicable to 2008 and mentions a function called iter$simple_intlist_to_tbl. Another best practice as far as report readability goes is that it should be clear on your report what data has been filtered. 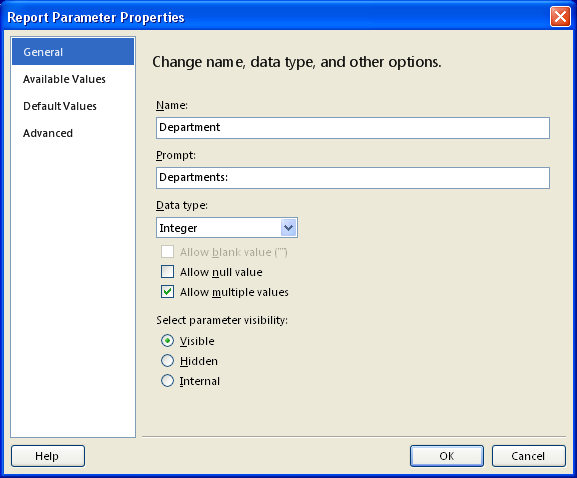 As the multi-value parameter is on focus here, I'll demonstrate how you can show the selected values on your report. 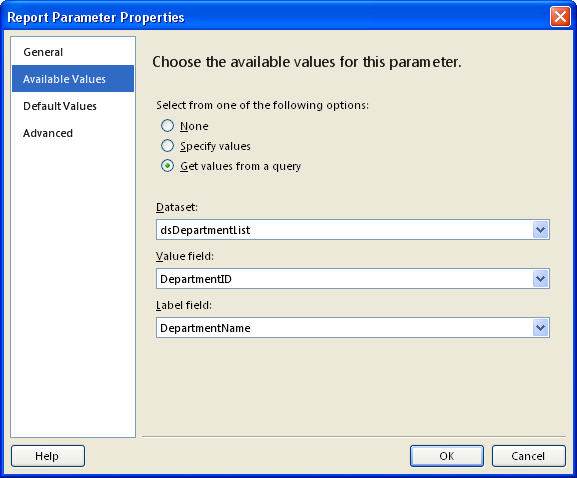 With this article I believe I've demonstrated that it is possible to pass multi-value parameters from a SQL Server Reporting Services report to a stored procedure, while applying some best practices such as giving the users a nice list of values to select from. And if you appreciated reading this, I will surely appreciate you clicking that nice little blue YES button a bit further down, next to my profile description.